Which is the best Programmer For iNAND, eMMC, eMCP Chip? When you want to repair Samsung, iPhone eMMC NAND Flash memory. it is very important to find an good programmer for mobile device: MoviNAND, iNAND, eMMC, eMCP Chip. which is the best Programmer For iNAND, eMMC, eMCP Chip? 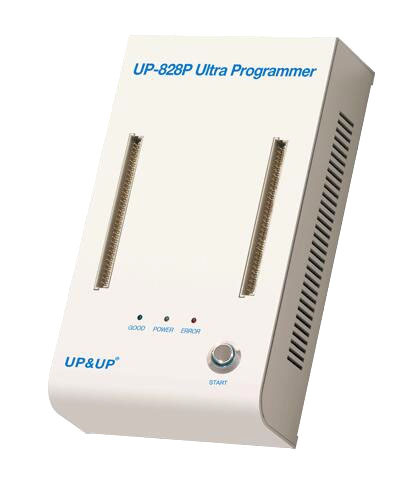 UP828P Ultra Programmer is the mobile device flash memory High Speed programmer, it can ability to acquire the data from a variety of mobile device flash memory, including: NAND FLASH, SERIAL FLASH, MoviNAND,iNAND, eMMC, eMCP Chip. Support almost mobile device memory chips: Samsung phones, iPhone device, Collpad phone, Samsung phones, HTC / Mi phones, BlackBerry Devices, others brand phones or Automotive navigation ic, Auto audio and other smartphones and tablets device. UP-828P High Speed programmer are fast and reliable when programming iPhone eMMC NAND flash devices, VBGA11P5P / VBGA134SP / LGA52P programmer adapter work with iPhone 4/5/6 eMMC NAND Flash. UP-828P High Speed programmer supporting the eMMC mobile devices from Collpad phone 8297/Y90/T2/8675 and others phones, UP-828P High Speed programmer are fast and reliable when programming Samsung phones eMMC NAND flash devices, it can be used to acquire the data from following flash memory: Samsung 8530 / 9100 / 9300 / 9500 / NOTE4 /mi phones. UP-828P Laptool Programmer also supporting the following eMMC mobile devices: other newer phones, smartphones and tablets, BlackBerrys phones, Automotive navigation ic, Auto audio MOVINAND/iNAND/EMMC memory. Nandrepair's UP-828P Programmer application with many up828 socket adapters, supporting a growing number of mobile device memory chips. FBGA167P Adapter ( Supports some of the NAND memory chips found in feature and older smartphones ). FBGA137P Adapter, Supports chips found in many feature and burner phones, Suit for 0.8mm pin pitch BGA package chips. EBGA64P Adapter, Suit for 1.0mm pin pitch BGA package chips, 8X8 arrays.